Kryptonian Warrior: Bloody hell ! A fire led police chief to "most grisly murder scene in his 35 years in law enforcement"... Turns out it was actually an old horror movie set haha! However, that didn't stop the police from spending 8 hours overtime investigating the scene before realising it was fake. "Firefighters who responded to a hotel blaze stumbled upon a blood-spattered hotel room littered with bottles of alcohol and even a piece of a scalp. 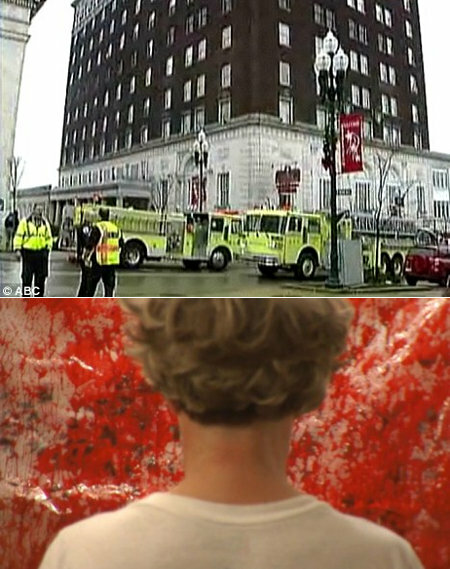 Police Chief J.R. Blyth, who was called in to investigate, described the discovery at the George Washington Hotel in Pittsburgh as 'the most grisly murder scene in his 35 years in law enforcement'. Detectives had spent eight hours of overtime on the investigation before Chief Blyth realised the blood wasn't real and that the murder scene was in fact the leftover set of a horror movie filmed two years ago with Corey Haim. The film called New Terminal Hotel shot a scene in the hotel and the owner, Kyrk Pyros, decided to leave the room untouched in case the crew had to come back for re-shoots. Mr Pyros was bemused by the police's discovery of the 'crime scene'." It was one of Corey Haim's last films :( and according to IMDB was never released in the cinema and will possibly be a straight to video title this year, if at all.